Post news Report RSS	SHOOTY TROOPS™ v0.7010 - Full of Surprises! Version 0.7010 release is here and it’s full of Surprises!!! Your favorite neighborhood gaming studio has released even more Early Release updates. While fine tuning this game and adding thumb-numbing, mind bending performance increases, the 804 also decided to give our players a few surprises with update v0.7010. Surprise #1 - "What's in the box?" 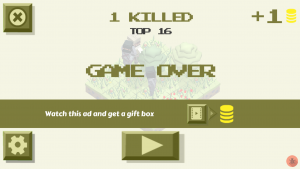 Every time that your enemies cause you to make a hasty strategic retreat, you now have a button option to "watch this ad and get a gift box". What's in the box? Certainly there is going to be some coin love that you can use to grow your character collection ... and who knows .... MAYBE MORE!!!! It's a Magical Mystery Gift Box!!! It could be anything ... or anybody .... THIS IS WHY YOU HAVE TO STAY UPDATED!!! You act like I am kidding but seriously ... stay updated. Surprise #2 - "Get your Polskie on!!!" Whether you speak Polish or are just a Polish language enthusiast, SHOOTY TROOPS™ is here to help you get your Polskie on. Our team has played with gamers from every continent and every time zone. We are hoping that we can reach out to them as developers now and deliver some jaw dropping games to them in their native tongue. We will continue to work on more language features, so make sure to keep checking our site and update notes. Surprise #3 - "Super Secret Promo Codes"
Do YOU have a Promo Code??? Cause all the cool kids are using them. Did you find it on Facebook??? Did you see it on Twitter??? Did you get it from your favorite Development Blog??? Well, fellow SHOOTY TROOPERS there ARE promo codes to be found ... and the game hipster in the back of your skull should be going crazy now, knowing there are rewards and content that THOSE OTHER GUYS HAVE and you don't. The search will be long and hard, grasshopper .... but the 804 hand is generous .... and the rewards abundant. 804's "Diesel" Dave has a lot of content he is itching to pour out. I can't guarantee he won't just CONTENT OVERLOAD BURST (C.O.B.™) tomorrow and throw out a few more amazing new characters and/or features. I just can't. He might do it. You've been warned!!! But we are unveiling for a short time, the character of the month for July ... He's Red .... He's White ... He's Blue-tiful!!! He's brave enough to wear striped pants and a bow tie. 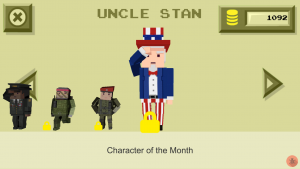 Ladies and gentlemen .... Uncle Stan!!! Applause and tears of joy are completely appropriate. It is a big moment for all of us. So, keep opening those gift boxes. That's the only way to unlock him!!! AND STAY UPDATED!!! A lot of great updates, promotions, and contests are currently in development for the release next month. Well, that's it for now. This is your 804 "Bush Wookie" Tom, signing off. Subscribe to the 804 Game Studios™ Development Newsletter or follow us on your social media platform of choice. Make your inner gamer happy ... Subscribe today.